Area: 468 sq. km. (180 sq. mi. ); about half the size of New York City. Cities: Capital: Andorra la Vella. Nationality: Noun and adjective — Andorran(s). 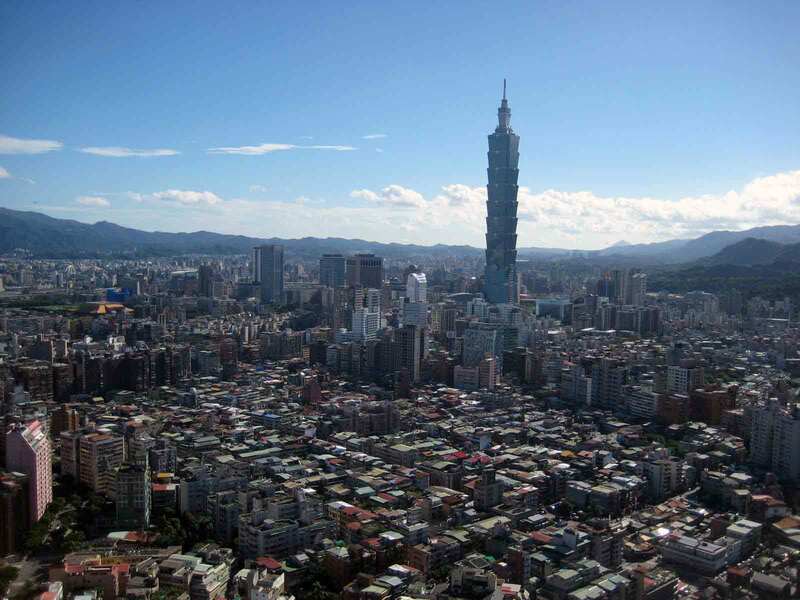 Population (end of 2010): 85,015. Annual population growth rate (2010): 1.1%. Ethnic groups: Catalan, Spanish, French, Portuguese. Languages: Catalan (official), Spanish, French. Education: Years compulsory: to age 16. Attendance — 100%. Literacy — 100%. Health: Infant mortality rate (2009): 3/1,000. Life expectancy (2008) — 84 years, male and female. Type: Parliamentary democracy that retains as its heads of state two co-princes. Constitution: Ratified in March 1993. Branches: Heads of State: Two co-princes (President of France, Bishop of Seu d'Urgell in Spain). Executive — Head of Government (Cap de Govern) and eight ministers (Executive Council). Legislative — Parliament (General Council), founded 1419, consisting of 28 members. Judicial — Civil cases heard in first instance by four judges (batlles) and in appeals by the one-judge Court of Appeals. The highest body is the five-member Superior Council of Justice. Criminal cases are heard by the Tribunal of Courts in Andorra la Vella. Subdivisions: Seven parishes (parroquies) — Andorra la Vella, Canillo, Encamp, La Massana, Ordino, Sant Julia de Loria, and Escaldes make up the districts represented in the General Council. Political parties/groups: Andorran Liberal Party, Social Democratic Party, and Andorra for Change Party. Natural resources: Hydroelectric power, mineral water, timber, iron ore, lead. Industry: Types: tourism (mainstay of the economy), tobacco products, furniture. Trade: Major activities are commerce and banking; no official figures are available. Duty-free status. 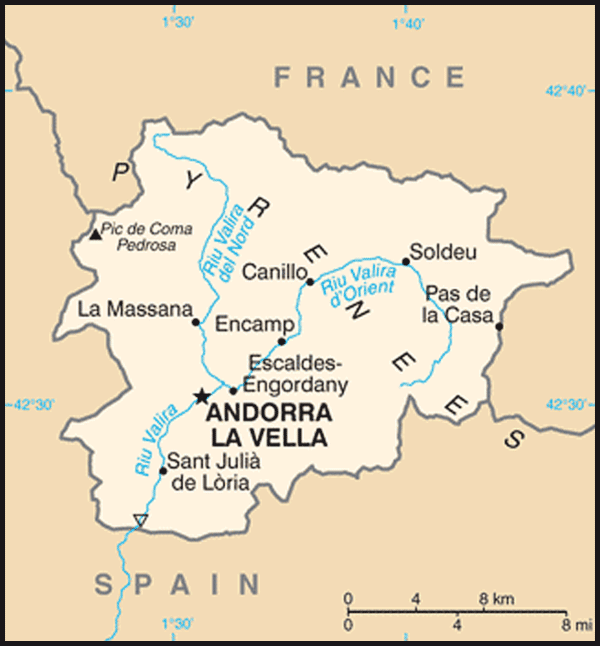 Andorrans live in seven valleys that form Andorra's political districts. Andorrans are a minority in their own country; they make up only approximately 38% of the population or about 32,000 native Andorrans. Spanish, French, and Portuguese residents make up the other 62% of the population. 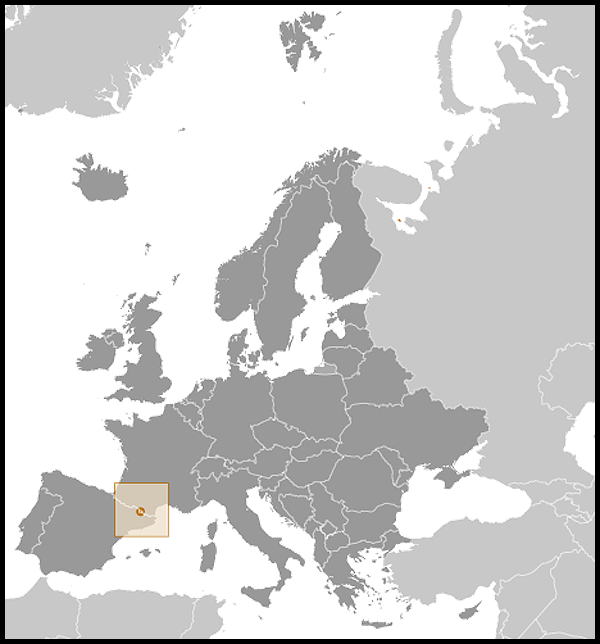 The national language is Catalan, a romance language related to the Provencal group. French and Spanish are also spoken. Education law requires school attendance for children up to age 16. A system of French, Spanish, and Andorran public schools provides education up to the secondary level. Schools are built and maintained by Andorran authorities, who pay also for Andorran teachers. French and Spanish schools pay for their own teachers. About 32% of Andorran children attend the French primary schools, 31% attend Spanish, and 37% attend Andorran schools. Andorran schools follow the Spanish curriculum, and their diplomas are recognized by the Spanish education system. In 1997, the University of Andorra was established. The University of Andorra has two graduate schools; the Nursing School and the School of Computer Science. Students can obtain a degree in business administration, nursing, or education sciences as well as computer science. Students can also follow virtual studies with Spanish and French universities. Out of the 1,183 students enrolled in university in the 2008-2009 academic year, 460 studied at the University of Andorra, 640 in Spanish universities, 74 in French universities, and 9 in other countries. Andorra is the last independent survivor of the March states, a number of buffer states created by Charlemagne to keep the Muslim Moors from advancing into Christian France. Tradition holds that Charlemagne granted a charter to the Andorran people in return for their fighting the Moors. In the 800s, Charlemagne's grandson, Charles the Bald, made Count of Urgell overlord of Andorra. A descendant of the count later gave the lands to the diocese of Urgell, headed by Bishop of Seu d'Urgell. In the 11th century, fearing military action by neighboring lords, the bishop placed himself under the protection of the Lord of Caboet, a Spanish nobleman. Later, the Count of Foix, a French noble, became heir to Lord Caboet through marriage, and a dispute arose between the French Count and the Spanish bishop over Andorra. In 1278, the conflict was resolved by the signing of a pareage, which provided that Andorra's sovereignty be shared between the Count of Foix and the Bishop of Seu d'Urgell of Spain. The pareage, a feudal institution recognizing the principle of equality of rights shared by two rulers, gave the small state its territory and political form. Over the years, the title was passed between French and Spanish rule until, in the reign of the French King Henry IV, an edict in 1607 established the head of the French state and the Bishop of Urgell as co-princes of Andorra. Given its relative isolation, Andorra has existed outside the mainstream of European history, with few ties to countries other than France and Spain. In recent times, however, its thriving tourist industry and developments in transportation and communications have removed the country from its isolation. The Andorran constitution was ratified and approved in 1993. The constitution establishes Andorra as a sovereign parliamentary democracy that retains as its heads of state two co-princes. The fundamental impetus for this political transformation was a recommendation by the Council of Europe in 1990 that, if Andorra wished to attain full integration into the European Union (EU), it should adopt a modern constitution that guaranteed the rights of those living and working there. A Tripartite Commission — made up of representatives of the co-princes, the General Council, and the Executive Council — was formed in 1990 and finalized the draft constitution in April 1991. Under the 1993 constitution, the co-princes continue as heads of state, but the head of government retains executive power. The two co-princes serve co-equally with limited powers that do not include veto over government acts. They are represented in Andorra by a delegate. As co-princes of Andorra, the President of France and the Bishop of Seu d'Urgell maintain supreme authority in approval of all international treaties with France and Spain, as well as all those that deal with internal security, defense, Andorran territory, diplomatic representation, and judicial or penal cooperation. Although the institution of the co-princes is viewed by some as an anachronism, the majority sees them as both a link with Andorra's traditions and a way to balance the power of Andorra's two much larger neighbors. Andorra's main legislative body is the 28-member General Council (Parliament). The Sindic General (president of the General Council), the Subsindic, and the members of the Council are elected in the general elections held every 4 years. A Sindic General and a Subsindic are chosen by the General Council to implement its decisions. They serve 4-year terms and may be reappointed once. They receive an annual salary. Sindics have virtually no discretionary powers, and all policy decisions must be approved by the Council as a whole. The General Council meets throughout the year on certain dates set by tradition or as required. At least one representative from each parish must be present for the Council to meet. Historically, within the General Council, four deputies from each of the seven individual parishes provided representation. This system allowed the smaller parishes, which have as few as 600 voters, the same number of representatives as larger parishes, which have up to 4,300 voters. To correct this imbalance, a provision in the 1993 constitution introduced a modification of the structure and format for electing the members of the Council; under this format, half of the representatives are chosen by the traditional system, while the other half are selected from nationwide lists. Every 4 years, after the general elections, the General Council also elects the head of government, who, in turn, chooses the other members of the Executive Council. The current Executive Council has eight ministers. The judicial system is independent. Courts apply the customary laws of Andorra, supplemented with Roman law and customary Catalan law. Civil cases are first heard by the batlles court — a group of four judges, two chosen by each co-prince. Appeals are heard in the Court of Appeals. The highest body is the five-member Superior Council of Justice. Andorra has no defense forces and only a small internal police force. All able-bodied men who own firearms must serve, without remuneration, in the small army, which is unique in that all of its men are treated as officers. The army has not fought for more than 700 years, and its main responsibility is to present the Andorran flag at official ceremonies. Andorra held early national elections on April 3, 2011. The Democrats for Andorra (DA), a center-right coalition led by Antoni Marti Petit that included the Liberal Party, obtained 22 seats in the 28-seat General Council. The Social Democratic Party (PS), led by former Head of Government Jaume Bartumeu, obtained 6 seats. Head of Government Marti took office in May 2011. This is the sixth government formed in Andorra since the ratification of the constitution in 1993. 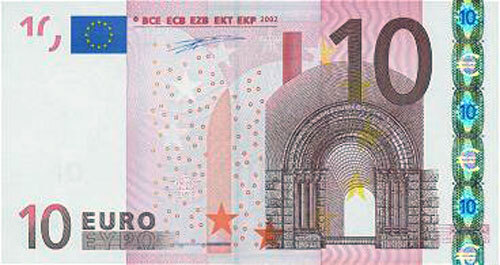 Andorra's economy and its relations with the European Union are among the new government's top priorities. There has been a redefinition of the qualifications for Andorran citizenship, a major issue in a country where approximately 37% are legal citizens. In 1995, a law to broaden citizenship was passed but citizenship remains hard to acquire, with only Andorran nationals being able to transmit citizenship automatically to their children. Lawful residents in Andorra may obtain citizenship after 20 years of residence. Children of residents may opt for Andorran citizenship after 18 if they have resided virtually all of their lives in Andorra. Mere birth on Andorran soil does not confer citizenship. Dual nationality is not permitted. Until 2008 non-citizens were allowed to own just a 33% share of a company, and only after they had resided in the country for 20 years would they be entitled to own 100% of a company. The country has now opened itself to foreign investors, allowing up to 100% ownership in activities and sectors considered strategic. By creating a modern legal framework for the country, the 1993 constitution allowed Andorra to base its economy on tourism and international banking and finance. Over the short term, Andorra will continue to confront a number of difficult issues and the need to develop the institutions necessary to address them, including tax reform. In addition to questions of Andorran nationality and immigration policy, other priority issues will include a housing shortage, real estate speculation, tourism, and refining its relationship with the European Union. Andorra maintains an embassy (http://www.exteriors.ad/index.php?option=com_content&view=article&id=399%3Aambaixada-dandorra-als-estats-units-damerica&catid=39&Itemid=57〈=en) in the United States at Two United Nations Plaza, 27th floor, New York, NY 10017; telephone 212 750 8064 / 8065; fax 212 750 6630. Andorra's national income in 2009 was approximately $3.6 billion, with tourism as its principal component. The country has been attractive for shoppers from France and Spain because of low taxes and duty-free allowances, and it has developed active summer and winter tourist resorts. With some 270 hotels and 400 restaurants, as well as many shops, the tourist trade employs a significant portion of the domestic labor force. There is a fairly active trade in consumer goods, including imported manufactured items, which, because they are taxed at lower rates, are less expensive in Andorra than in neighboring countries. Many Andorrans have supported the country's reform initiatives over the years, believing that Andorra's continued prosperity required fuller integration with the European Union. Andorra's tax status has had a significant effect on its relationship with the EU, with which Andorra began negotiations in 1987. An agreement that went into effect in July 1991 set duty-free quotas and placed limits on certain items — mainly milk products, tobacco, and alcoholic beverages. Andorra is permitted to maintain price differences from other EU countries, and visitors enjoy limited duty-free allowances. In June 2004 Andorra signed a series of accords with the EU in the fields of economic, social, and cultural cooperation. Tax legislation was also approved that taxed interest from monetary products and fixed-interest investments belonging to non-residents, while maintaining bank secrecy. Although less than 2% of the land is arable, agriculture was the mainstay of the Andorran economy until the upsurge in tourism. Sheep-raising had been the principal agricultural activity, but tobacco-growing is lucrative. Most of Andorra's food is imported. In addition to handicrafts, manufacturing includes cigars, cigarettes, and furniture for domestic and export markets. A hydroelectric plant at Les Escaldes, with a capacity of 26.5 megawatts, provides 40% of Andorra's electricity; Spain provides the rest. Since the establishment of sovereignty with the ratification of the constitution in 1993, Andorra has moved to become an active member of the international community. In July 1993, Andorra established its first diplomatic mission in the world, to the United Nations. In early 1995, the United States and Andorra established formal diplomatic relations. Andorra also expanded relations with other nations. Andorra is a full member of the United Nations (UN) United Nations Educational, Scientific and Cultural Organization (UNESCO), World Health Organization (WHO), Telecommunications International Union (ITU), United Nations World Intellectual Property Organization (WIPO), World Tourism Organization, Food and Agriculture Organization (FAO), International Civil Aviation Organization (ICAO), World Customs Organization (WCO), United Nations Conference on Trade and Development (UNCTAD), International Criminal Court (ICC), International Committee of the Red Cross (ICRC), Council of Europe, Organization for Security and Cooperation in Europe (OSCE), Organization for the Prohibition of Chemical Weapons, International Center of Studies for Preservation and Restoration of Cultural Heritage (ICCROM), and Interpol, among others. Since 1991, Andorra has had a special agreement with the European Union. In 2008, Andorra announced its endorsement of the Proliferation Security Initiative, designed to combat illegal trafficking in weapons of mass destruction. The United States established diplomatic relations with Andorra in February 21, 1995. The two countries are on excellent terms. The U.S. Ambassador to Spain is also accredited as Ambassador to Andorra. United States Consulate General officials based in Barcelona (http://barcelona.usconsulate.gov/) are responsible for the day-to-day conduct of relations with Andorra. The Andorran Permanent Representative to the United Nations, Narcis Casal, was accredited as Andorra's Ambassador to the United States in July 2009.